This is a trial shot on a concept that's been rattling around in my head. Not a bad first try in my opinion. I like the way the color of the vase ties in with D's shirt. The lighting is a little too dramatic though. BTW, this is my first "serious" photo with my new (to me) D7000. Hopefully I get around to a full realization of the concept because I think it'll be pretty cool. I'm going to have to sharpen my Photoshop skills though. There is one artificial light: A LumoPro LP160 speedlight through a Lumiquest Softbox III set up to camera-left, just above and behind the mirror and shining back onto my subject. I tried to get the softbox as close to my son as possible, without getting in the photo, in order to get the most softness out of it. The LumoPro was shot in manual flash mode (actually that's the only mode it supports!) at 1/32 or 1/64 power (can't remember which). The lighting you see is pretty much how it looked coming off the camera. The Softbox III is awesome for its fall-off. It's a very contained and controllable light. The only catch is you have to get it really close to your subject. The photo was processed in Aftershot Pro and that's where it really came alive. A lot of things were done, but all of them in very modest amounts. 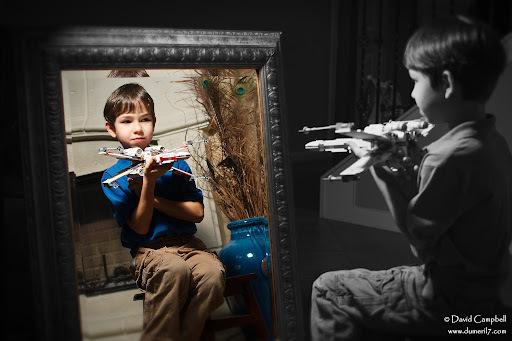 I also cropped the image and cloned an area near the mirror to remove the tell-tale light stand. Wow. I think it works hands down. I especially like that he isn't smiling - lends to the introspective/dreamy quality. Very nice! D was probably thinking about how he was going to spend the $2 I promised him for posing for me. ;-) I've been working on some techniques to amp up the dreamy factor. I may have to have a rare do-over on it.